With its performance oriented JTP range of cars, Tata aims to reach out to young, performance seeking car buyers. 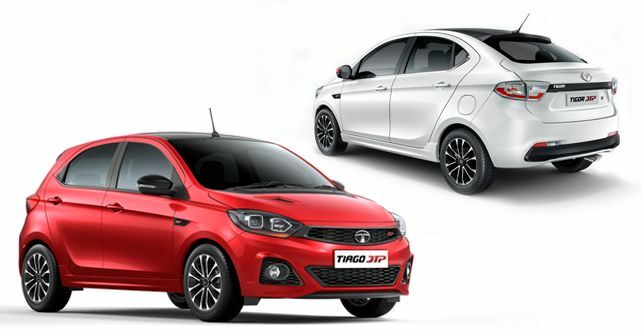 The Tiago JTP is priced at Rs. 6.39 lakh while the Tigor JTP retails at Rs. 7.49 lakh, ex-showroom Delhi. With its JTP range of cars, Tata Motors aims to make a connect with its young performance seeking car buyers. The new range of Tata cars with all of their features and different driving modes are already tailored to cater to the modern car buyer. And the new performance oriented will cater to an untapped audience until now. With this intention in mind, Tata Motors has launched its first ever performance-oriented model range consisting of the Tiago JTP and Tigor JTP. Powered by a 1.2 litre, three cylinder, turbocharged petrol engine, the Tiago and Tigor JTPs boast of 110bhp of max power at 5,000 rpm and 150Nm of peak torque is spread between 2,000 – 4,000 rpm. The engine is mated to the car’s standard gearbox, although with different ratios to cater to the more powerful engine. It must be noted, that the engine itself is the same unit as that of the standard versions of Tiago / Tigor petrol. The difference with the JTP models is that they come hooked to a turbocharger which allows for the higher power and torque output figures. To put things in context, the standard petrol 1.2 Tiago and Tigor generate 83bhp of max power at 6,000 rpm and 114Nm of peak torque at 3,500 rpm. Its worth noting that the Tiago turbo weighs only 2kg more than the standard model at 1,016kg while the Tigor turbo weighs 9kg less than the standard car at 1,051kg in kerb weight. To deal with the added firepower, both cars feature a lowered ride height and stiffer suspension setup to improve the handling traits for more spirited driving. And to match the added oomph, Tata has restyled both cars with sportier front and rear bumpers, smoked lamps, new and larger wheel rims with wider tyres along with black styling elements such as a black roof, ORVM casings and rear spoiler. This black theme continues to the interior as both cars get all black interiors with red colour inserts all around. The Tata Tiago JTP is priced at Rs. 6.39 lakh while the Tata Tigor JTP is priced at Rs. 7.49 lakh, (ex-showroom, New Delhi).